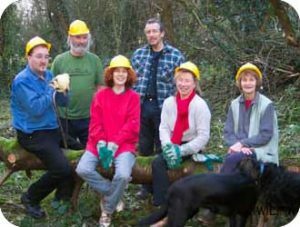 The Friends of Colwick Woods is a not-for-profit organization whose aim is to protect, enhance and promote the woods for people and for wildlife. Objectives include the conservation of the wildlife of the woods, the protection and enhancement of the landscape, documentation of the history of the woods, the promotion of public and educational use, and community involvement. The Friends of Colwick Woods needs the support that the membership of local people gives – people who enjoy the woods, the panoramic views, and the flowers and wildlife and who value its green open spaces in the heart of the city. Membership can be as active as you wish. You may just want to be associated with the aims of the group or you may wish to take a more active role in the various activities of the group. The benefits of membership include newsletters, invitations to guided walks, plant and animal identification courses, bat and butterfly watches, and other events throughout the year. We also have monthly meetings, voluntary work parties and litter picks. Please complete the membershipform (click on the button below to download it to your computer) and enclose it with your payment. One year’s membership costs £3 for an individual or £6 for a family of up to four people in a household. Please also consider that an extra donation to the group’s fund is always welcome. Payment can be made at any of our meetings in cash or by cheque (cheques should be made payable to The Friends of Colwick Woods. Alternatively, post or hand in the form and payment to our Chairman, Richard Brown, at the address on the membership form. We look forward to your support; we value your membership.